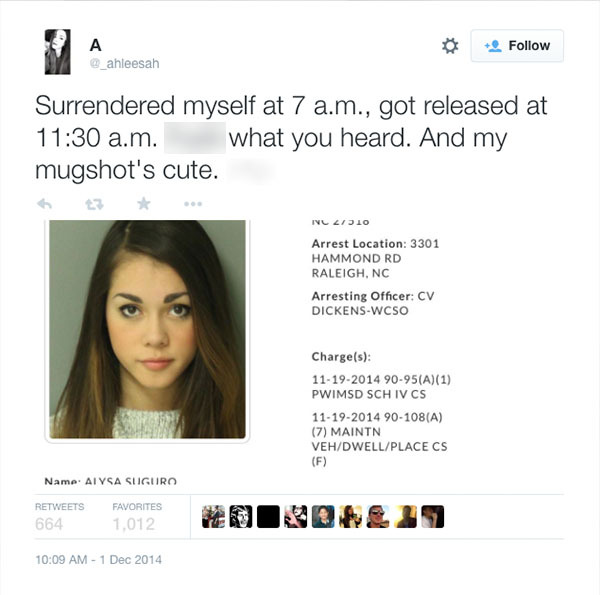 RALEIGH -- An 18-year-old Cary, North Carolina woman who was dubbed "cute mugshot girl" after her arrest on drug charges last year is in trouble with the law again. Alysa Bathrick was charged in Raleigh Friday with shoplifting. The teen's mugshot went viral in December when she was arrested on charges of possession of a schedule IV controlled substance with intent to distribute, according to booking documents Bathrick posted to her own Twitter account. When a Twitter user asked Bathrick what her charges were, the teen replied with "xanax homie."